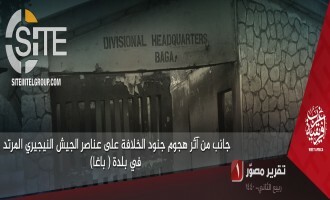 The Islamic State's (IS) 'Amaq News Agency released a video from West Africa Province (ISWAP) showing fighters roaming in the captured town of Baga, while separately, the group claimed another attack in Borno State, near Monguno. 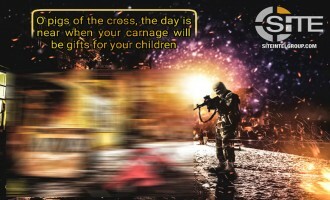 The Islamic State (IS)-linked al-Battar Media Foundation released an essay calling for supporters in the West to “increase” terrorist attack during holiday celebrations. The Islamic State's West Africa Province (ISWAP) released a photo report on its recently claimed attack on Nigerian soldiers in Baga. 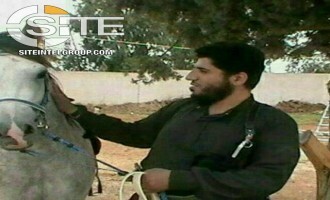 Iyad Nazmi Salih Khalil (AKA Iyad al-Tubaysi, Abu Julaybib al-Urduni), a Syria-based al-Qaeda (AQ)-affiliated militant official, was reportedly killed. 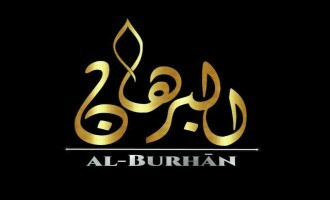 Pro-AQ Telegram channels informed on December 28, 2018, that Abu Julaybib was killed in a strike by the Syrian military, but did not indicate the location. Remarking on the announcement by U.S. President Donald Trump of pulling out American troops from Syria, an Islamic State (IS)-linked media group warned that despite that act, the "flames of war" will still reach America. Jama'at Nusrat al-Islam wal Muslimeen (JNIM), the Mali-based branch of al-Qaeda (AQ), claimed what it described as a "complex ambush" of Burkinabe security forces near the Mali-Burkina Faso border. The Islamic State (IS) released the 22nd episode in a video series providing statistical breakdowns of IS operations, covering in this installment the week of December 20-26, 2018. The Islamic State's West Africa Province (ISWAP) claimed inflicting dozens of casualties among Nigerian soldiers in Baga. An alleged group in Saudi Arabia threatened locations for "Crusader" celebrations and warned Muslims not to approach them. 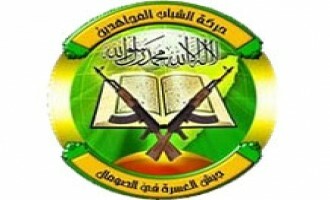 The Uqba bin Nafi Battalion, the Tunisia-based branch of al-Qaeda in the Islamic Maghreb (AQIM), denied the claim by Prime Minister Youssef Chahed that one of its fighters was killed on Mount Ouergha in Kef governorate, and criticized Chahed and his government for the "economic deterioration" of the country. IS Supporter Shares "Mali Province" Video of Fighters in Mali Executing "Traitors"
An Islamic State (IS) supporter shared a video from what he described as "Mali Province," showing fighters brutally executing "traitors" with knives and guns. 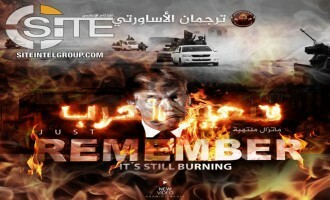 Three Islamic State (IS)-linked groups released a joint video inciting lone wolves in the West to carry out arson attacks and portraying the U.S. troop pullout from Syria as American defeat. Ansar Ghazwat-ul-Hind (AGH), an al-Qaeda (AQ)-aligned group in Jammu and Kashmir, confirmed in the killing of its deputy leader and five other fighters in a clash with security forces in Pulwama. With its last attack in Kenya two months ago, the Somalia-based Shabaab al-Mujahideen Movement resumed its operations with a strike on Kenyan border guards in Mandera. In Nigeria's Borno State, West Africa Province of the Islamic State (ISWAP) claimed killing two Nigerian soldiers near the same area it attacked 12 days prior. A statement attributed to the Hadramawt division of al-Qaeda in the Arabian Peninsula (AQAP) claimed credit for the bombing of the Shihr district police station, but denied that its fighters had a part in inflicting casualties among civilians in the Yemeni governorate. The Tripoli division of the Islamic State's Libya Province claimed credit for the three-man suicide raid at the Libyan Foreign Ministry in the capital. The Islamic State's West Africa Province (ISWAP) claimed an attack on Nigerian soldiers in the same area it struck one-week prior, in Nigeria's Borno State. The Salahuddin division of the Islamic State (IS) released a video focusing on two suicide attackers involved in a joint operation on a Popular Mobilization Unit (PMU) position to the west of Tikrit, and a raid by fighters on Iraqi military barracks in Samaraa and the execution of a national security intelligence member. 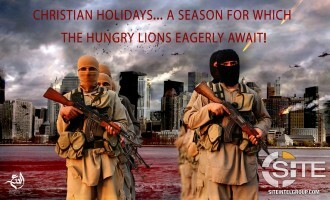 Posters displaying threats for attacks in the West and incitement for lone wolves have escalated as Christmas and New Year's Eve approach, with a dozen in a three-day period. 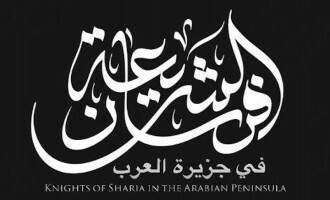 Al-Qaeda in the Arabian Peninsula (AQAP) claimed its first attack on Islamic State (IS) fighters in Yemen, bombing a vehicle and ambushing another in the country's al-Bayda' governorate. 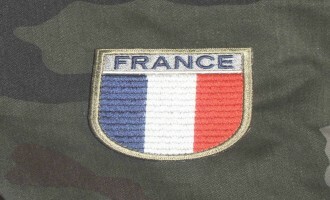 Islamic State (IS) supporters distributed a call to kill the families of French soldiers. 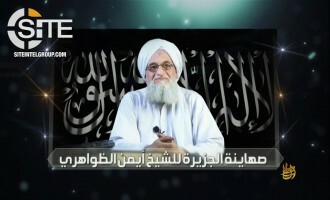 Al-Qaeda (AQ) leader Ayman al-Zawahiri urged Saudi Muslims to immigrate for jihad and strategic planning in existing battlefields, and called on them to attack American and Israeli interests to bring down Gulf governments. Continuing its high frequency of attacks, the Islamic State's Nigeria-based West Africa Province (ISWAP) claimed another operation in Borno State, killing five Nigerian soldiers in a clash near Dikwa. 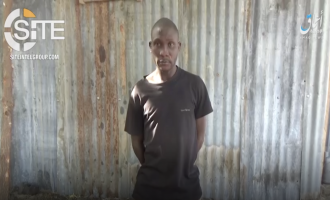 The Islamic State's Nigeria-based division, West Africa Province (ISWAP), has released footage of a captured Nigerian soldier. 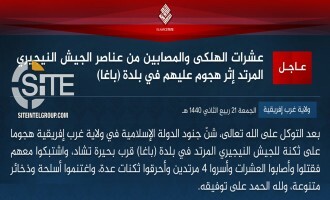 The Islamic State's West Africa Province (ISWAP) claimed two attacks on Nigerian soldiers in Borno, one targeting military barracks in Gajiram, and the other, ambushing soldiers between Dambuwa and Sabongari. 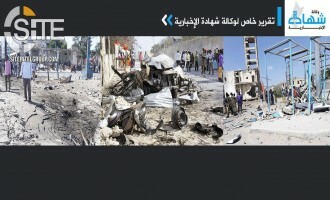 The Shabaab al-Mujahideen Movement, al-Qaeda's (AQ) branch in Somalia, claimed killing and wounding dozens in a double car bombing, one involving a suicide attacker, at the Presidential Palace in Mogadishu. Abdullah al-Muhaysini, a prominent Saudi cleric and jihadi figure in Syria, discussed the American withdrawal from the country, finding it a "great incidence" and a "new turn" in the Syrian revolution. 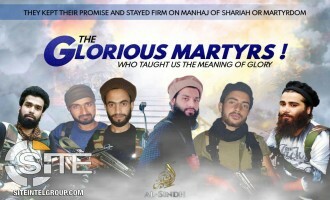 Through its Manba al-Jihad media unit, the Afghan Taliban released a video demonstrating the training of its fighters. The 22 minute, 15 second, Pashto-language video, entitling, "Jihadi Training," was issued on December 20, 2018. Islamic State (IS) supporters, as individuals and as groups, published a plethora of threats to raise fear among Westerners and incite lone wolves to strike as Christmas and New Year's Eve festivities draw close. 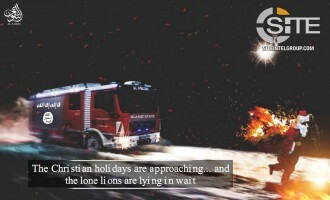 An Islamic State (IS)-aligned Spanish group released an incitement video for lone-wolf attacks in America and Europe during Christmas. The Shabaab al-Mujahideen Movement claimed inflicting 40 casualties among Ethiopian forces in a bombing in Somalia's Bay region, and provided a follow-up to its prior report on clashing with American and Somali forces in Lower Shabelle. The Islamic State (IS) released the 20th episode in a video series providing statistical breakdowns of IS operations, covering in this installment the week of December 13-19, 2018. 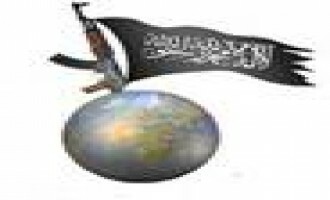 The General Command of the Shabaab al-Mujahideen Movement ordered its fighters to eliminate the "disease" of the Islamic State (IS) in Somalia. The Twitter user who posted the video of the purported murderers of the two Scandinavian women in Morocco, also identified the English-speaking fighter who appeared at the end of the Islamic State's (IS) "Flames of War 2" video. 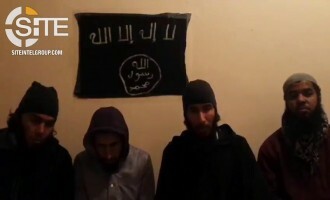 A video surfaced of the alleged murderers of two Scandinavian women in Morocco pledging to the Islamic State (IS). Using cartoons and booklets, an Islamic State (IS)-aligned French group promoted jihad and suggested an attack on the National Assembly. The Shabaab al-Mujahideen Movement, al-Qaeda's (AQ) branch in Somalia, reported its fighters engaging in clashes with American and Somali forces in Lower Shabelle region, and additionally claimed attacks on Somali police and soldiers in Hiran and Mogadishu. 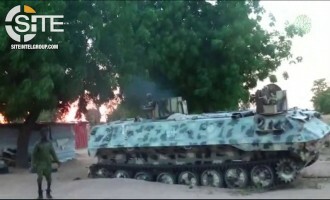 Jama’at Ahl al-Sunnah Lil Dawa Wal Jihad, or "Boko Haram," released a video of its clash with Nigerian soldiers in Molai village, located near Maiduguri, the capital of Borno State. 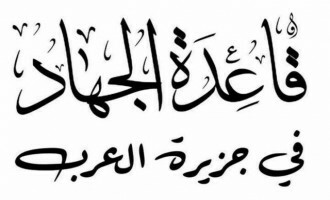 Jama'at Nusrat al-Islam wal Muslimeen (JNIM) announced that it will discontinue media productions on its foreign hostages and alleged that no negotiations are currently taking place between it and their respective governments. 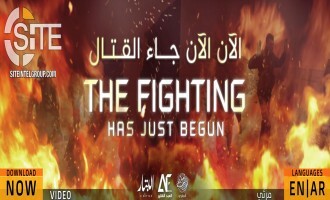 Two days after claiming its first offensive on the Shabaab al-Mujahideen Movement in Somalia, the Islamic State (IS), through its 'Amaq News Agency, released footage of the clash. After claiming an attack on Nigerian soldiers and capturing one near Monguno, in Nigeria's Borno State, the Islamic State's West Africa Province (ISWAP) took credit for a second attack in the same area on the same day, and taking another soldier prisoner. 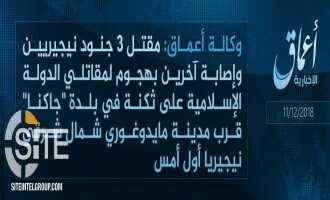 The Islamic State's Nigeria-based division, West Africa Province (ISWAP), claimed capturing a Nigerian soldier and killing three others in an attack near Monguno in Borno State. 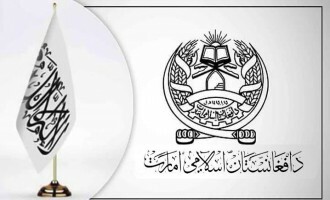 The Afghan Taliban reported on the first of its three-day meeting in Abu Dhabi regarding "peace and reconstruction of Afghanistan," attended by U.S. envoy Zalmay Khalilizad and representatives of Pakistan, Saudi Arabia, and the UAE, and reiterated its refusal to meet with Afghan government officials. 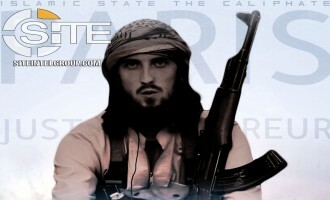 As Islamic State (IS) supporters participate in a campaign to reaffirm their commitment to the group, an IS-linked media unit released a video renewing its pledge to Abu Bakr al-Baghdadi and promoting lone-wolf attacks in the West. 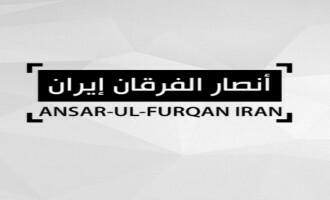 The Balochistan-based Ansar al-Furqan released a video portraying the December 6, 2018, suicide bombing at a Chabahar police headquarters as revenge for the killing of officials. A Facebook page specializing in disseminating Islamic State (IS) and IS-aligned nasheeds (chants) promoting the group, also shared a poster inciting for “lone wolf” attacks on Christmas. The Islamic State (IS) claimed killing and wounding close to 20 Egyptian border guards in an ambush in Central Sinai. 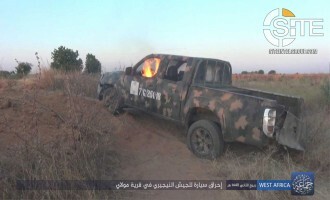 The Nigeria-based Jama’at Ahl al-Sunnah Lil Dawa Wal Jihad, or "Boko Haram," published photos of its clash with Nigerian soldiers in Molai village, and the aftermath. The Shabaab al-Mujahideen Movement, al-Qaeda's (AQ) branch in Somalia, claimed killing 12 Ethiopian troops in Bakool region and five Somali explosives experts in Lower Shabelle. 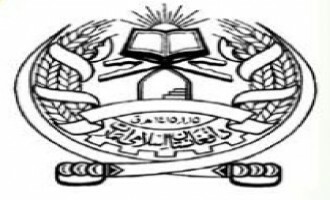 The group's Shahada News Agency reported on the two attacks and a third, in Mogadishu, on December 16-17, 2018. 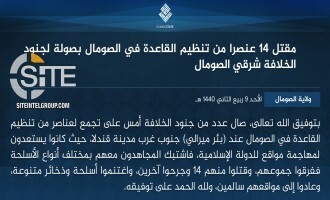 The Islamic State (IS) claimed its first offensive on the Shabaab al-Mujahideen Movement in Somalia, carrying out a preemptive strike on its fighters in the north of the country and killing 14. The Islamic State's (IS) 'Amaq News Agency released a video showing confessions of two tribal militiamen in the al-Barth area, south of Rafah, and Sinai Province fighters beheading them. 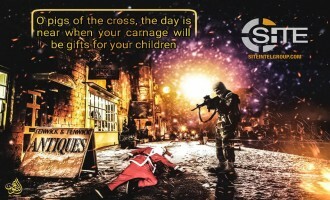 Islamic State (IS)-aligned groups warned of attacks during the holiday season, using Christmas symbols such as Santa Claus on their posters, and showing fighters on two streets in England. 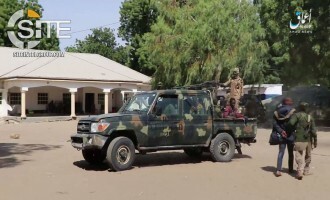 After taking credit for an attack on Nigerian soldiers near Gamboru, in Nigeria's Borno State, the Islamic State's West Africa Province claimed killing five soldiers in Gudumbari on the same day. The Gaza-based Jaysh al-Islam (Army of Islam) praised lone-wolf attackers in Jerusalem and West Bank and incited for lethal strikes involving explosives, poisoned knives, and vehicles. The Shabaab al-Mujahideen Movement claimed a bombing near the central bank in Bosaso, in northern Somalia's Bari region, and expelling the Galmudug Security Force (GSF) from what it described as a "strategic town" in Galguduud. The Anbar division of the Islamic State (IS) released a video showing 13 bomb and artillery attacks on Iraqi military vehicles and positions, and other operations, including one ending in the grisly execution of a soldier. The Islamic State (IS) released the 20th episode in a video series providing statistical breakdowns of IS operations, covering in this installment the week of December 6-12, 2018. 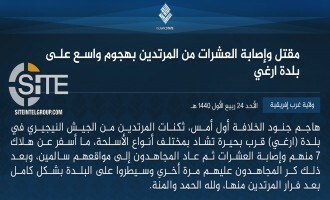 The Islamic State's West Africa Province (ISWAP) claimed an attack on Nigerian soldiers near Gamboru, a town in Nigeria's Borno State. An Islamic State (IS) supporter depicted Pope Francis as a group captive in a poster dismissing claims that the IS has been destroyed. As the Christmas and New Years holidays approach, Islamic State (IS)-aligned group incited for and warned of attacks in the West, some with images of Santa Claus. 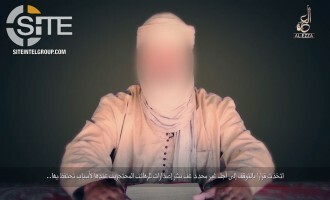 The Shabaab al-Mujahideen Movement announced that it executed an electoral committee member alongside two Somali soldiers for "apostasy," and claimed a strike on a Djiboutian (AMISOM) base in Hiran. Al-Qaeda in the Arabian Peninsula (AQAP) claimed three attacks on UAE-backed Security Belt Forces (SBF) in Yemen's Abyan governorate and sniping a Houthi fighter in al-Bayda'. 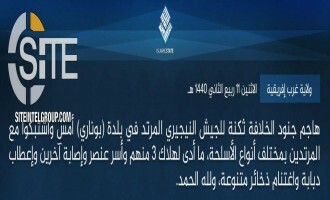 The Islamic State (IS) claimed a dual suicide bombing involving Algerian and Uyghur fighters near Hajin, bringing the single day total of bombers in that area to four. 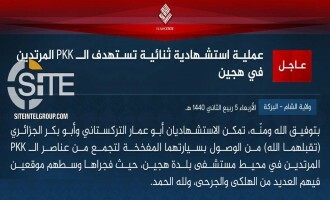 The Islamic State's West Africa Province (ISWAP) claimed killing three Nigerian soldiers in an attack on their barracks in Kukawa, a town in Borno state, close to Lake Chad. 'Amaq Identifies Strasbourg Gunman as an IS "Soldier"
The Islamic State's (IS) 'Amaq News Agency identified the shooter in Strasbourg, France, as a "soldier" of the group. Amidst the ongoing heated clashes between the Islamic State (IS) and Syrian Democratic Forces (SDF) in and around Hajin, a town in Deir al-Zour, the IS claimed inflicting 25 casualties in two suicide bombings. 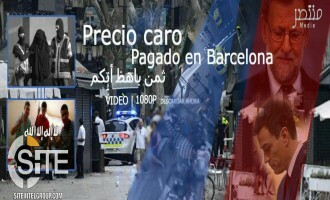 An Islamic State (IS)-aligned group released a Spanish-narrated video threatening attacks in Barcelona, using a montage of photos from the IS-claimed attack on Las Ramblas in August 2017 as a reminder. 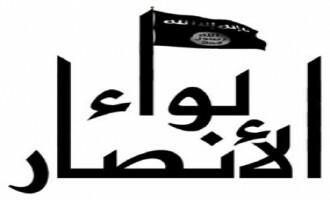 ISJK Media Unit Promotes Last Words of Slain Fighter on Maintaining "Mission of Khilafah"
A media unit of the self-described Islamic State Jammu and Kashmir (ISJK) promoted in a video the last words of a slain fighter on maintaining the "mission of Khilafah (Caliphate)". 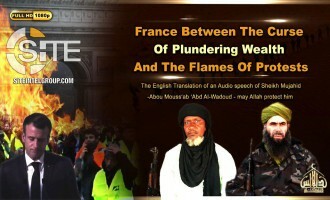 Abu Musab Abdul Wadud, the leader of al-Qaeda in the Islamic Maghreb (AQIM), addressed the Yellow Vest protests in France, attributing the cause of the fuel taxes and other issues to French military spending abroad, and denying the killing of the Macina official in Jama'at Nusrat al-Islam wal Muslimeen (JNIM). 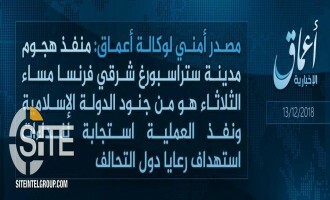 The Islamic State's (IS) 'Amaq News Agency reported an IS attack on Nigerian army barracks near Maiduguri, the capital of Borno in northeastern Nigeria. UPDATE: Shortly after the issuance of the 'Amaq report came the formal communique from the group's West Africa Province (ISWAP). Two fighters from the Nigeria-based Jama’at Ahl al-Sunnah Lil Dawa Wal Jihad, or "Boko Haram," lectured on the Islamic concept of al-Wala' wal Bara' (loyalty and disavowal) in a video. The Afghan Taliban claimed inflicting 23 casualties among American advisors and Afghan soldiers in a suicide bombing in Kabul. A former Islamic State (IS)-linked group confirmed that Abu Muhammad al-Masri, the previous judge of the IS' Military Bureau who the IS had imprisoned on charges of dissension and sedition, was killed, though the circumstances are unknown. The Barakah division of the Islamic State (IS) released a video of attacks on multiple axes in Syria's Deir al-Zour governorate against Syrian Democratic Forces (SDF), and featuring a gory scene of a fighter standing atop a bloody corpse in victory. The Islamic State (IS) released the 19th episode in a video series providing statistical breakdowns of IS operations, covering in this installment the week of November 29 - December 5, 2018. 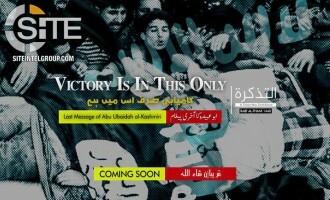 An article attributed to an Indian member of Islamic State Jammu and Kashmir (ISJK), and the first to be provided in English as well as Urdu in the "Risalah" newsletter, promotes allegiance to the IS despite its detractors. The same day it reported an infiltrator fighter killing six soldiers in Helmand province, the Afghan Taliban claimed that 1,106 "Kabul administration workers" joined its ranks in November 2018 and delivered it weapons and military gear. 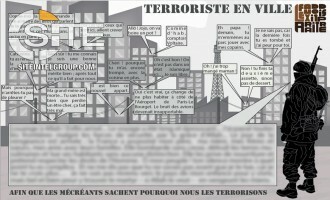 Jihadists persist in publishing posters aimed at inciting lone wolves to capitalize on the Yellow Vest protests in Paris, France, and use the large gatherings and diverted security as an opportunity to attack. 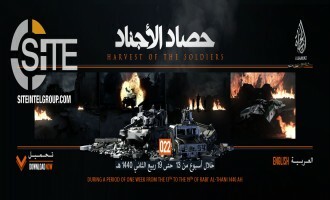 The al-Qaeda (AQ)-aligned jihadi coalition the 'Incite the Believers' Operations Room released a video showcasing attacks by its "Sniper Brigade" in Syria's Aleppo, Hama, and Latakia governorates. The Shabaab al-Mujahideen Movement claimed killing two Somali military commanders in a bombing in Mogadishu and also thwarting a raid by U.S. Special Forces and Somali soldiers in Lower Shabelle. Ansar al-Furqan, a Sunni Balochistan-based jihadi group, claimed credit for the suicide bombing an a police headquarters in Chabahar. 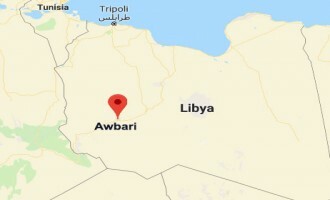 Al-Qaeda in the Islamic Maghreb (AQIM) denied the claim by U.S. Africa Command (AFRICOM) that 11 of its members were killed in an airstrike in southwest Libya, alleging that they were Tuareg people without an "organizational link" to the group and, in turn, urging Tuaregs to seek revenge. 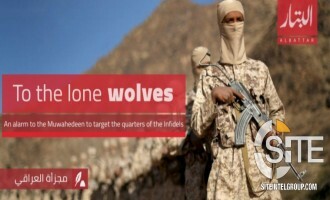 The editors of the pro-Islamic State (IS) periodical "Liwa' al-Ansar" (Brigade of the Supporters) continued in the second issue their promotion of lone-wolf attacks they introduced in the inaugural edition, featuring an infographic on IS and IS-inspired attacks in the West. The former Islamic State (IS)-linked group to which Austrian jihadist Mohamed Mahmoud (AKA Abu Usama al-Ghareeb) belonged, announced the killing of an official, but disputed reports that he died alongside Mahmoud and two others in a U.S. airstrike on the IS prison in which they were held. 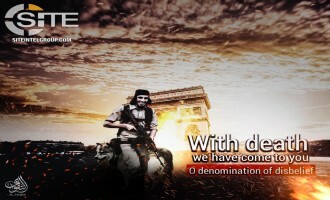 Additional Islamic State (IS)-aligned groups and jihadists participated in the recent campaign to use the French unrest as an opportunity for attacks, publishing posters in Arabic, English, and French to inspire lone wolves. 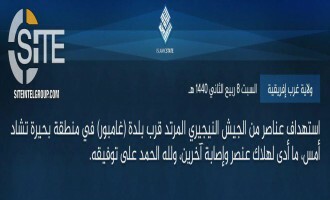 The Islamic State's Nigeria-based division, West Africa Province (ISWAP), claimed its fourth attack within a period of six days, striking Nigerian army barracks in Mallam Fatori in Borno State. 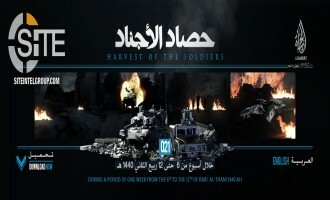 HTS Video Promotes its Fighters as "Tempered by Tribulations"
The Syria-based Hay'at Tahrir al-Sham (HTS) released a short video promoting its fighters as "tempered by tribulations" and willing to sacrifice for their objectives. 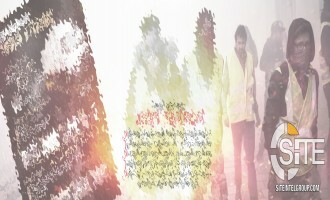 The 2 minute, 38 second video was produced by the group's Amjad Media Productions, and was issued on December 1, 2018. Amidst its upward thrust in attack volume in Nigeria and its surroundings, the Islamic State's West Africa Province (ISWAP) claimed killing 17 Nigerian soldiers in an attack in the country's Yobe State. As civil unrest continues in Paris, France, with violent protests for the third consecutive weekend, jihadists reiterated their call to lone wolves to capitalize on the situation and mount attacks. 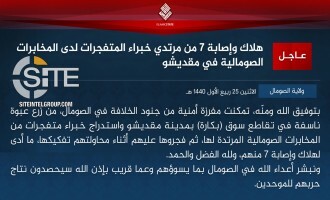 The Islamic State (IS) claimed inflicted seven casualties among explosive experts in a bombing in the Somali capital, Mogadishu. The group's Somalia Province issued a communique on December 3, 2018, stating that a "security detachment" planted an improvised explosive device (IED) at Bakara market and detonated it as explosives experts attempted to dismantle it. 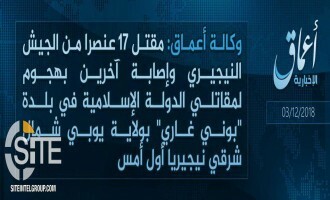 The Islamic State's (IS) 'Amaq News Agency reported that 17 Nigerian soldiers were killed in an IS attack in Buni Gari, a town in Nigeria's Yobe State. The Afghan Taliban claimed shooting down a U.S. Chinook helicopter in Kapisa province, killing all of the soldiers onboard, and in a separate message, mourning the death of its "governor" for Helmand in a U.S.
Jama'at Nusrat al-Islam wal Muslimeen (JNIM), al-Qaeda's branch in Mali, reportedly rejected the claim by U.S. Africa Command (AFRICOM) that its airstrike in Libya killed 11 al-Qaeda members, alleging instead that the victims were Tuaregs with no connection to the group. 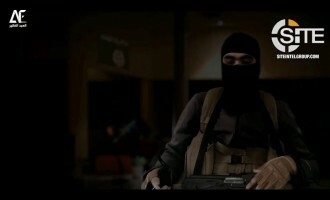 An Islamic State (IS)-aligned group warned of attacks on New Year's Day in New York City and the West in general. 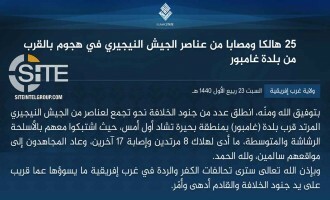 The Islamic State's West Africa Province (ISWAP) claimed killing seven Nigerian soldiers and wounding dozens of others in attack in Arege, a town in Nigeria's Borno State, and then taking control over it. 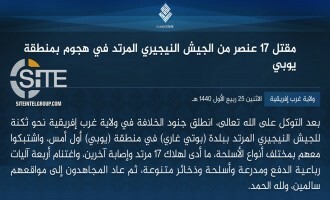 The Islamic State's West Africa Province (ISWAP) claimed inflicting 25 casualties among Nigerian soldiers in an attack near Gamboru, a town in Nigeria's Borno State. The Afghan Taliban denied receiving weapons from Iran and elsewhere, assuring supporters that its arms cache consists of war spoils or weapons from Soviet-Afghan war. 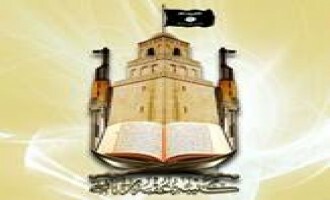 Group spokesman Muhammad Yusuf issued a statement on November 30, 2018, rejecting allegations by Brian Hook, Senior Policy Advisor to the U.S.
Ansar Ghazwat-ul-Hind (AGH), an al-Qaeda (AQ)-aligned group in Jammu and Kashmir, gave security guidelines in English and Urdu to fighters in the region, covering safety online and on the ground.